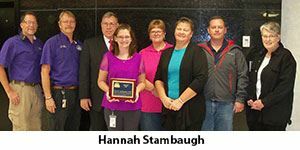 For the past four years, Hannah has served as KEMA’s representative to the Kansas Assoc. of Counties Governing Board. She was first asked to serve by Vaughn Lorenson, and even though it would cost her many hours above and beyond her regular duties, she was willing to accept the appointment and represent her fellow EM’s across the state. I’m not sure anyone could have predicted, though, how well she would serve our Association and our profession. Through her tireless efforts, County Commissioners and other local officials throughout Kansas now have a much better understanding of the role EM plays in normal operations, and in disaster response. When it was discovered a member of the League of Municipalities was falsely teaching cities across our state that they could deal with KDEM and FEMA directly, without going through their county, Hannah used her position with the KAC to work with the League’s leadership to correct this misinformation and repair the damage that had been done. 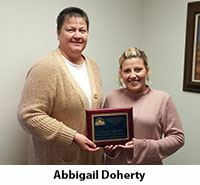 It is with great pleasure to nominate Abbigail (Abbie) Doherty for consideration for the 2018 Outstanding Emergency Management Support Professional, in recognition of her support of emergency management in Barber County. It is difficult at times in a small department to keep up with all that is tasked especially when the emergency manager and deputy wear other hats in the county. Abbie volunteers for Barber County Emergency Management as an administrative assistant, and was instrumental with the development and revamping the spotter network, and storm ready process in Barber County. Abbie strives to minimize the impact of emergencies and maximize the effectiveness of Barber County's response to, and recovery from emergencies. She demonstrated this by many long hours putting together battle books not only for emergency management, but other responding agencies. She continues to take lead in projects that truly reflect the four phases of emergency management. Abbie is one of the hardest working, most dedicated people I have ever met. She's very conscientious about her work, and always ensures that her tasks are complete efficiently and to the very best of her ability. What makes Nathan such an excellent instructor you may ask? The following are just a few examples that come to mind when thinking of why he deserves this honor. Nathan has work ethic that does not quit, always giving 100% to provide top quality training and instruction for every class he teaches. He is very approachable and connected with his students and has gifted and unique abilities when instructing and relaying concepts to adult learners. Nathan demonstrates that being a great instructor is a constant work in progress to always improve. He looks critically upon his own instructional practices, reflects upon them and finally, ask why something worked and why it didn’t to both enhance the material quality and gain student comprehension. His professionalism and willingness to go above and beyond to help others succeed is evident to his students in every class he teaches. Nathan is also a gifted facilitator and has quality skills in exercise development. He shares his ideas and technical knowledge with others and reaches out to anyone who needs his expertise. Nathan also understands the team approach when instructing and in the development of exercise plans. His willingness to work and collaborate with others and his flexibility to change and grow makes him a respected team member to his peers. As well as being an exemplary instructor, Nathan has put in a great deal of effort into building strong relationships with all disciplines of the Emergency Response Community. He has earned the respect of Kansas Emergency Management Professionals state wide and we feel he is truly the best candidate for this award. 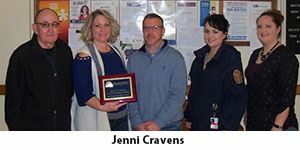 Jenni Cravens started as the assistant EM director for Cheyenne County in May 2017. Cheyenne County Emergency Management also covers the counties of Rawlins and Sherman. Jenni always has a positive attitude and not afraid to handle any task given. She also wears many hats and assists with emergency preparedness and Haz Mat team at Cheyenne County Hospital and serves on Cheyenne County EMS. Cheyenne County was is the process of EOP review when Jenni joined the EM team. She hit the ground running and played a valuable role in updating the county EOP, and coordinating planning meetings. Within her first year Jenni took on the task of establishing a community shelter team. She worked hard recruiting community volunteers, coordinating training, and establishing shelter procedures. Once the team was established, along with Jenni’s leadership, received grant funding to outfit a community shelter with a generator and worked with Red Cross for needed supplies. This past winter our county was hit with a blizzard/winter storm that crippled travel and stranded motorists for 2 days. She not only fulfilled her role in the County EOC but also got to activate the shelter team for the first time. Her leadership, and efforts paid off as the shelter team was a huge success and much needed response capability. She is always willing to jump in and help where needed, including assisting in other counties. Kathleen Fabrizius, Trego County Emergency Manager is well respected by her peers and has been a valuable resource to KEMA and the Emergency Management profession. Kathleen is able to process and function under stressful circumstances in situations that have a constantly evolving scenario, she is able to think outside the box and adapt quickly to the tasks that have been presented to her. Kathleen is a genuine leader and leads by example. She has been an active member of the NW Homeland Security since 2008, NW Homeland Security Region Secretary for 4 years, Vice Chair for 2 years and is now the Chairperson. She inspires others to do more, learn more and become more. She is always willing to grow as an individual and expand her knowledge and education. Mentoring others is a passion of Kathleen’s and she takes great pride in offering her knowledge unconditionally. Kathleen demonstrates an outstanding work ethic and presents a professional, caring and honorable attitude towards peers. She is meticulous towards detail and is always eager to do what is needed, when it is needed and most of the time already working on the task before being asked. Kathleen has been an Emergency Manager since 2008 and an IMT member as the Public Information Officer for the NW Division for 8 years. She has become known for her PIO role in major deployments including the Barber County Fires in March 2016 and the Hutchinson Fire in March of 2017. When Kathleen is deployed to an Incident, it doesn’t matter if it is in her County or some other County; she “adopts” that Community as her own and works as hard for them as she does for her own. She has said that “When she is deployed, that Incident becomes personnel for her” and that caring attitude is evident in her work ethic. This excellent attitude and genuine concern for others is why Kathleen deserves to be Emergency Manager of the Year.